With the temperature soaring with each passing day, it is time to finally put away all things winter attire and bring out the summer essentials. Time to bid adieu to chunky layers and make way for soft, free-flowing pieces; replace bejewelled heavy necklaces with light, delicate ones and swap poly and wool blends with cotton, linen and organic based fabrics. While most of these pieces are already a part of our everyday wardrobe, it is time to put them to good use beat the heat in style! The summer wardrobe essentials list has been prepared keeping in mind the hot and humid weather experienced across India. 1. White Top: Be it long or short, a traditional tunic or a classic white shirt, no summer wardrobe is complete without a white top. Ideal to beat the head and easy to style, a white top is an absolute must-have. 2. Cotton Pants: Whether you like them printed or plain, in bold shades or delicate pastels, fitted or flared, cotton fabric pants are a perfect summer alternative to the poly-blend trousers and leggings. 3. Dainty Jewellery: No matter how much you love those statement, chunky jewellery, summer is all about dainty pieces. Delicate necklaces, elegant cuff and simple rings are just the perfect accessory for this hot weather. 4. Summer Dress: Maxi, mini or midi, printed or embellished, flared or A-line, summer dress is the prefect blend of comfy and trendy. They can easily be dressed-up or down depending on the time of the day, occasion and location. 5. Denim Shirt: Layer with a tee, use it as a wrap over a bikini or simply pair it with coloured jeans, the denim shirt can effortlessly be styled in a number of ways. No matter how you wish to style it, opt for soft denim or a chambray instead of classic thick denim. 6. Oversized Tote: Carry it to office, beach or to a date, oversized tote bags functions as a home away from home, where your day-to-day stuff can easily be stocked away. 7. Flat Sandals: Not only are they super comfortable, but they pair pretty well with all kinds of summer clothes and can easily be worn to most occasions. 8. Shorts: Whether you like Daisy Duke kind of shorts or the trendy skorts or prefer the high-waist, culottes style, shorts are ideal for surviving the hot, humid days. In case shorts are not your style, mini/midi skirts work just as well for this season. 9. Florals: This is a cliché, but no summer is complete without its share of blooming flower prints. The style may change; the designs may evolve, but floral will forever remain summer quintessential. 10. Sunglasses: Sunglasses are a year round staple. However, in summer they become an absolute must have. Along with protecting your eyes from the scorching sun, sunglasses also help you make a chic style statement. 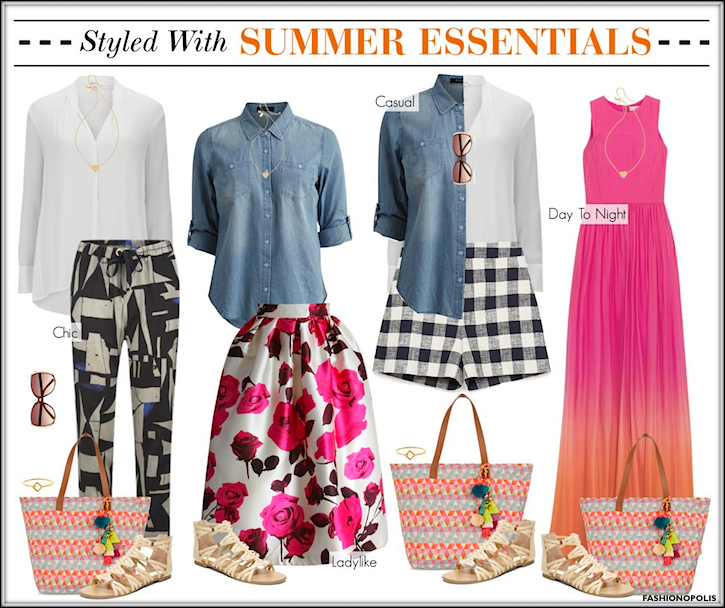 Using all the pieces from the summer wardrobe essentials list, here are a few styling ideas. I love styling posts like these by you. they are just bang on and you have such amazing style sense.